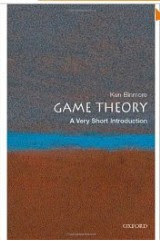 I stumbled on Game Theory: A Very Short Introduction while updating my wishlist. It was at the local library, so on a whim I checked it out. I'm glad I did - the book was absolutely fascinating. Unfortunately, I needed to return it before I had a chance to complete it. But, from what I read, I can say with real confidence it's a winner. Game theory, a topic I know nothing about, studies different scenarios to find out what the ideal strategy would be. I can vaguely recall studying the Prisoner's Dilemma in school - but I can't recall anything more than the question. The book itself is, as the name suggests, an introduction to the topic. It's written with a mixture of history, humor and facts. My only regret is that I didn't read through it with a notepad and pen, trying to simulate some of the exercises discussed. I plan to check out the book again (or just bite the bullet, and buy it off Amazon). When I do so, I'll plan to go slow and really wrap my head around the topics discussed. I have a sense that the outcome of studying Game Theory may be similar to that of my study of statistics. As a programmer, it totally opened my eyes to a new form of problem solving. In the case of statistics, I realized that there's ways to tackle problems which are too large and messy to compute in perfect detail. This book definitely piqued my interest on the topic of Game Theory, and so while I didn't get through it all - I can say it accomplished its mission. Friday Funny: Cheesiest 80's Music Video. Ever.